Golf The Galleries Exhibit at The Sheldon Art Galleries. Play a round of mini-golf at the playable, artist-designed, nine-hole mine golf installation located in the art galleries at The Sheldon. To play the exhibit is $10 for adults; $6 for children 12 and under. Viewing the exhibit is FREE! Extended hours during the Golf the Galleries exhibit. See website for all the details. 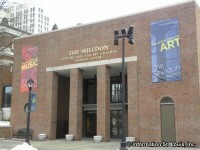 The Sheldon Art Galleries are housed in the Emerson Galleries Building adjacent to Sheldon Concert Hall which is located in the Grand Center Arts District in St. Louis, Missouri. The Art Galleries have over 7,000 square feet of gallery space which features changing exhibits in the categories of photography, installation work, architecture, painting, printmaking, sculpture, jazz history and children's art. The Galleries hosts over 20 free exhibitions and offers educational programs for adults and children. The Sheldon Art Galleries hours are Sunday and Monday, closed; Tuesdays, 12pm to 8pm; Wednesday - Friday, 12pm to 5pm; Saturdays, 10am to 2pm. The Art Gallery is also open one hour prior to Concert Hall performances and during intermission. Closed on major holidays. Directions: Located on Washington Blvd, just west of Grand Blvd, adjacent to The Sheldon Concert Hall in the Grand Center Arts District.